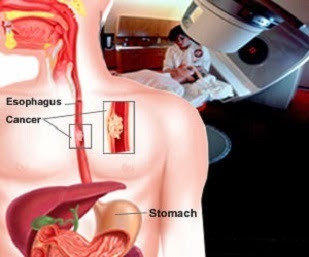 Esophageal Cancer is that type of cancer which is associated to the esophagus. This type of cancer generally occurs through the lining tissues of esophagus. Esophagus is also known as food pipe which carries the food from throat to the stomach. This is an uncommon cancer. It is most common in the developing nations like Asia and African countries. Esophagus cancer can develop anywhere in the nearby parts of the esophagus. I can happen due to excessive smoking and drinking and also due to abnormal eating habits and the back action of the acid present in the stomach. There are two types of esophageal cancer one in the upper part and second in the lower part that are Squamous cell carcinoma and Adenocarcinoma of esophagus respectively. 1. 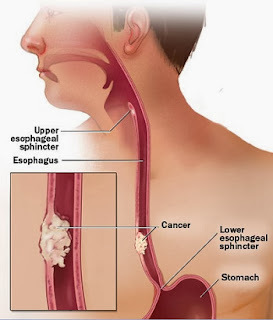 Squamous Cell Carcinoma of esophagus :- This type of esophagus cancer is formed in the upper part of the esophagus and it is common in the Asian and African countries. This type of cancer is caused due to the drinking and smoking at high rates. 2. Adenocarcinoma of esophagus :- This type of esophagus cancer is formed in the lower parts of the esophagus near the stomach. This is associated with the backward flow of the acid present in the stomach. This leads to obesity and increase in the belly.